Where are all the polishers on Mars when you need ’em? Imitation is the sincerest form of flattery but it’s also one of the key points of innovation. How often have we heard of so-and-so game doing something first and providing a template of sorts for other games to build off of? After all, without Diablo, we wouldn’t have Path of Exile, Torchlight or Grim Dawn. Without Doom, we wouldn’t have had the entire first person shooter genre. 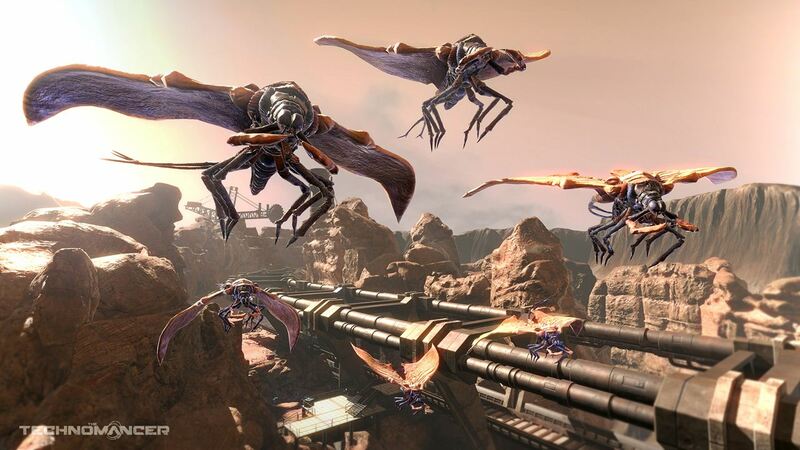 In that regard, it’s easy to see the influences that the Mass Effect franchise has had on Spiders’ The Technomancer. 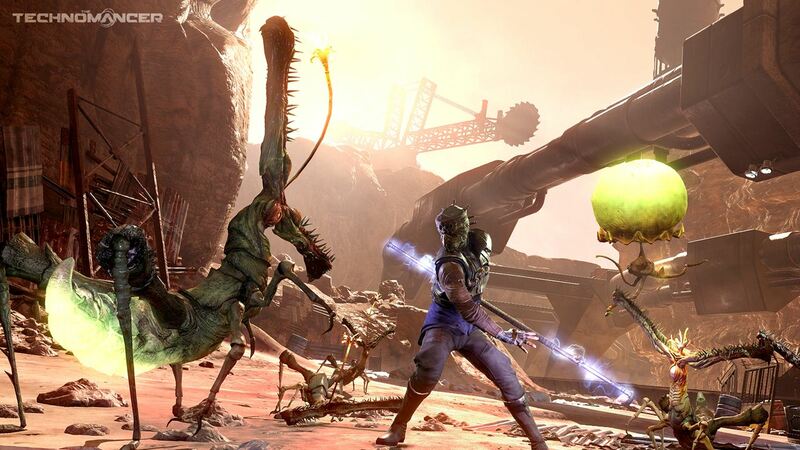 From the character interactions and dialogue choices to the long-term effects of your decisions and companions, The Technomancer seemingly held potential as an alternative to the big leagues. The key word is “potential” though. Despite some decent environment design and admittedly smooth combat movement, The Technomancer shows only flashes of brilliance throughout its long, dragging campaign. You start off as Zachariah, a Technomancer in training who begins his ascent to officer on Ophir, a colony on Mars. This being the future, the planet’s social system is broken up into various factions including the Abundance Army (who you’ll serve in the beginning), the ASC (an Internal Affairs like organization), the Mutants and many more. In the beginning, your main purpose is to accompany your teacher Sean (yes, Sean. Don’t even ask) to a special dome teeming with insects to learn the truth about Technomancers. Following this revelation, you’re sworn into the brotherhood but it doesn’t take long before the ASC takes an interest in your affairs, thus prompting you to venture outside of Ophir for the sake of survival. The beginning of The Technomancer begins much as you’d think – with a long narrative VO setting up the scenario on Mars, including the scarcity of water. It’s decidedly old-school in this approach and especially so when it takes to introducing you to Zach’s world and character. You’ll spend a good couple of hours trying to acquaint yourself with the world, meeting characters, completing side quests and main missions and just generally smacking things in the face. The set-up itself is actually fairly unique but it falls by the wayside with its shallow characters and their voice acting. Zach’s voice acting is fairly one note – it somehow achieves the feat of immaturity while still being boring. I guess the point is he’s a recent officer and still somewhat young but when you consider examples like Skies of Arcadia and Grandia 2(which released almost two decades ago), it’s obviously been done better elsewhere. This isn’t to say that Spiders’ budget meant other corners were cut. The visuals for The Technomancer are decidedly compelling, from when you enter Ophir and glance upon its metal trees for the first time. Venturing into the Slums paints a distinct picture, showcasing the downtrodden and their problems while still feeling lived into. Though the graphics aren’t the best, they’re still leagues above what you’d expect from most other B-grade open world RPGs. In fact, as far as creating the worlds of such games goes, The Technomancer may be one of the better efforts in a while. Character design sadly doesn’t benefit from this. Many of the characters look typically drab and samey. At least the clothing does a decent job of distinguishing them down the line, especially when dealing with various factions inside and outside of Ophir. And while performance was pretty good all around on PC, it doesn’t take long before backtracking through the same environments for hours on end that a sense of tedium sets in. Sure, you’ll venture to an Aurora camp here and a lost city there and probably navigate the sewers for missions. But most of The Technomancer‘s gameplay consists of exploring the same restricted environments, which are pretty poorly laid out and require constant checking of your mini-map, for hours at a time. There’s only so much you can do with an industrial Mars aesthetic and The Technomancer could have done well to adjust the pacing so that you explore newer places faster. Combat is another area where The Technomancer could have used improvement. On the surface, it’s interesting enough – three different styles, along with your lightning abilities, can be used at a specific time. You can spend skill points on these different styles and level up your Technomancer abilities, opt for additional upgrades in skills, allot points in different perks that benefit your Charisma or Crafting abilities among others (and play a role in skill checks during conversations), and increase your base stats like Agility and Strength every few levels or so. The game is fairly rewarding with the levels and offers a good amount of customization – you’ll definitely dabble in more than one style throughout the game. For me, it was a mix between the Rogue and Warrior, outputting high damage and switching to crowd control when necessary. Movement between targets felt pretty solid though I found it to be much better without targeting a single foe. The problems arise – as they usually do – when you get into the nitty gritty of things. 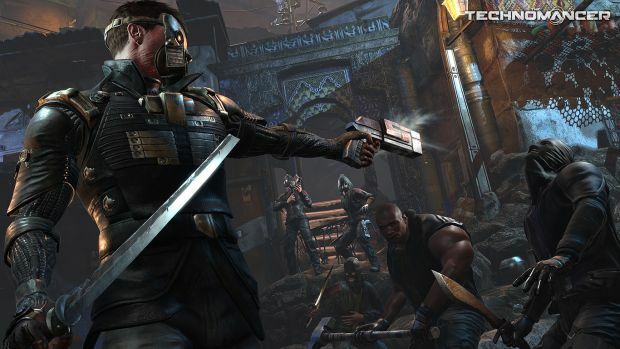 The Technomancer‘s combat feels very much like an action RPG, sort of like The Witcher 3. Stats like disruption play a key role in determining how well you interrupt enemy attacks. Even if you hit an enemy before their strike lands on you, there’s no guarantee that you’ll stop their attack in the process. Couple this with the high damage that enemies can lay out – even on Easy with a few upgrades on your person – and combat quickly becomes a random exercise in dodging to ensure you’re not kited into a corner and taking every single hit at once (and that’s not including scenarios with ranged enemies). At times, it felt like the Warrior’s staff just wasn’t doing it – even the stun kick wasn’t doing much to disrupt foes – and I opted for the Rogue’s blade to output tons of damage (Props to you if you can figure out the best way to utilize the Guardian with its slow movement and dodging capabilities). Even then, it felt like enemies were tanking a lot of punishment in the process of dying. Upgrading critical hit damage did turn the tides in my favour on occasion but it certainly felt odd to be slashing a regular enemy eight to nine times before he did. Make sure you save copiously as well – The Technomancer doesn’t have a very reliable auto save system in the open world, which kind of kills some of the excitement of diving head first into encounters. At least some of the quests are intriguing and the factions system is played up decently enough. Granted, there was a mission where treating Mutants harshly earned a negative reputation with the faction and I still managed to gain a Mutant companion later on but that’s a different matter entirely. It felt kind of cool after a point to be judged for some of my actions and asked to justify why I had done what I had done. Then again, some quests are fairly straightforward and lack a compelling narrative. I didn’t really care all that much about who the mole was in my group, especially because the starting companions are so boring/annoying (and this doesn’t really improve much later). Helping a mother find her daughter, who got into some rather nasty business with the mob, would have been memorable if (a) I wasn’t running around the poorly laid out slums, talking to various NPCs to find her, and (b) ultimately making a choice that served no purpose other than to push my karma up or down. It also doesn’t help that a lot of these quests are in the same confined areas, thus making you run past the same environments and locales over and over and over again. The motivations behind your character aren’t exactly compelling you all that much either. Some of the stories behind the companions, like Scott Seeker, are interesting but they never really open up all that much to really draw you in. The Technomancer isn’t an awful game. The potential it holds eventually does shine through on occasion. You’ll explore a vast world and have tons of things to do. When you get used to the nuances and quirks of combat, you’ll appreciate the responsiveness of its targeting and movement. The lack of polish did veer its ugly head in other respects such as the inability to set waypoints on one’s map or simply keeping track of one icon while following a quest. Then there are the odd animation glitches. At times, during cutscenes, you can see slightly stutters from one set of dialogues to the next. It’s very slight but very noticeable and can feel pretty jarring in the beginning. Overall, the initial slog feels draining at times and aside from gaining a level or two, I never felt like I had achieved all that much or had a lasting impact on the world. An upgrade here and there which still didn’t save me from being annihilated by groups of enemies, a new weapon I can’t use until I spec into Strength or Agility more and a new skill that may increase my damage all the more slightly. Woohoo. If you’re looking for an alternative open world action RPG of sorts, one which channels the Mass Effect series even with its own unique setting, you might want to check out The Technomancer. That being said, there are dozens of other action RPGs with better combat, story, characters, quests and so on that you could be playing instead. The Technomancerseems to capture a lot of the mechanics involved in a genre such as this but lacks a lot of the heart, personality and polish that makes games like Mass Effect so memorable.